Phytophthora sojae is one of the many soilborne oomycete (watermold) pathogens that can infect soybean from planting to harvest. 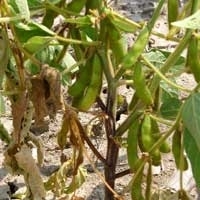 Soybean is the primary host for this pathogen. 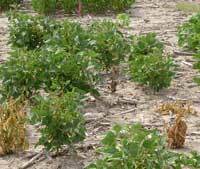 Symptoms of early-season infection by Phytophthora — brown lesions and collapsing tissue — are indistinguishable from the damping-off symptoms caused by Pythium and other pathogens belonging to the Oomycetes. Development of symptoms later in the season is directly related to the level of genetic resistance present in the cultivar. Soybean cultivars with higher susceptibility will develop a greater amount of root rot as well as a diagnostic chocolate-brown stem canker from the base of the plant extending up the stem, often accompanied by root rot. Considering the extensive losses that were reported during the 1960s, Phytophthora root and stem rot has been managed effectively with a combination of host resistance, seed treatments, and improved drainage. 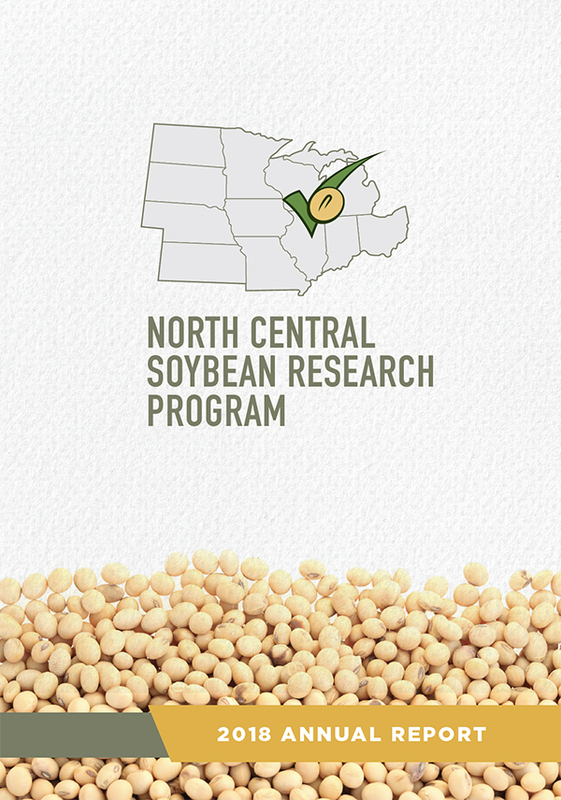 Much of this success is due to major research efforts undertaken over the past two decades and continues today with check-off funding provided by the Ohio Soybean Council, Iowa Soybean Association, Minnesota Soybean Research and Promotion Council, North Central Soybean Research Program, and the United Soybean Board. As in many host–pathogen systems with a limited host range, there are major resistance genes, called Rps (Resistance Phytophthora sojae), in soybean for P. sojae. Most of the Rps genes have an immune type response or a very strong resistance response. More than 20 different major resistance genes have been reported in soybeans from China, Japan, and South Korea, but few are deployed in cultivars. To date, the Rps genes named Rps1a, Rps1b, Rps1c and Rps1k, and to some extent Rps3a and Rps6 have been incorporated into soybean germplasm for commercial use in the United States and Canada. The Rps genes 1d, 2, 3b, 3c, 4, 5 and 7 have not been commercially deployed because pathogen populations are already present that could successfully cause disease on these plants. Similar questions have arisen with Rps8, as this gene is not effective towards populations of P. sojae from Missouri, but it is effective towards populations in more northern regions. At least six new potentially effective Rps genes are in the works. With checkoff support from the United Soybean Board and the North Central Soybean Research Program, teams of researchers in 3 states are working together to complete the genetic mapping and to identify key genetic markers associated with these resistance genes. The goal is to release adapted, highly resistant germplasm in different maturity groups each year to private soybean breeding companies who will then incorporate the material into new highly-resistant commercial varieties. As in other host-pathogen systems with a gene-for-gene interaction, there are numerous pathotypes of Phytophthora sojae, with more than 50 different pathotypes characterized within a single field. A pathotype describes the ability of the pathogen to cause disease on a specific Rps gene. Initial surveys of Phytophthora sojae were conducted in late 1960s to mid-1980s in Ontario, Canada and the United States. These surveys identified simple pathotypes, where the isolates recovered could only cause disease on plants with one or two Rps genes. In the early 2000s, isolates of Phytophthora with a greater degree of complexity began to emerge. Some pathotypes have the ability to cause disease on soybean varieties with several Rps genes. Over the past two years, soil from more than 292 soybean fields was sampled across Iowa, Indiana, Illinois, Michigan, Minnesota, South Dakota and Kentucky. Work is in progress to recover the Phytophthora from these soils and characterize the isolates for their ability to cause disease on soybean cultivars with the common Rps genes used today. Due to this high pathogen diversity and complexity, partial resistance, also called quantitative disease resistance or field resistance, has become a priority. Partial resistance has been shown to provide protection when diverse pathotypes are present and it does not limit yield. In the P. sojae–soybean system, partial resistance is expressed as lower levels of root rot and the absence of stem rot in cultivars that have high levels of partial resistance. Kottman (combination of high partial resistance plus 2 Rps genes). Prior to the deployment of cultivars with Rps1k, there was a greater interest in quantitative resistance. The cultivars ‘Resnik’ and ‘Williams82’ have Rps1k combined with high to moderate levels of quantitative resistance. This most likely played a large role in the longer life of Rps1k (more than 20 years) compared with Rps1a which was not effective shortly after it was deployed. Through these check-off sponsored studies, the teams have identified many plant introductions and cultivars with high levels of partial resistance to P. sojae. Genetic mapping studies have shown that resistance is moderately to highly heritable, with some soybean populations having several minor genetic regions contributing a small proportion to the overall resistance, while others have major genetic regions that contribute more than 20% of the resistance response. In fields with known Phytophthora root rot problems or conditions that would favor disease, the current recommendation is to always choose a cultivar with the best levels of partial resistance available in the desired maturity group. Partial resistance will not eliminate Phytophthora root rot, but it may delay disease onset. Select a cultivar based on which specific resistance genes are still known to be effective in your region. The Rps genes in soybean for P. sojae are effective at the time of planting. However, quantitative resistance is not expressed until later growth stages. 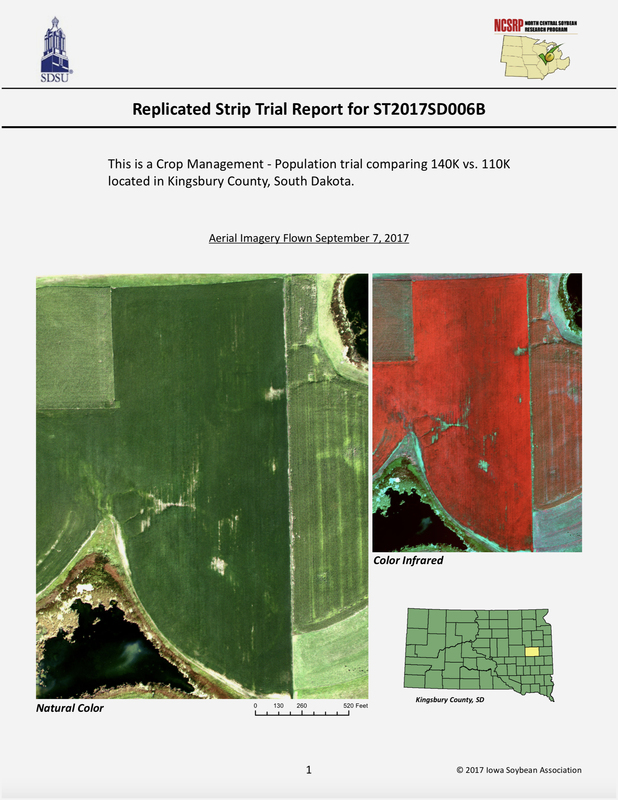 Fungicide seed treatments have increased plant stands and yield in numerous regional field trials when environmental conditions are conducive for disease development. More importantly, there were significant differences between non-treated seed and treated seed for both moderately susceptible and moderately resistant cultivars evaluated in high disease environments. This indicates that all cultivars can benefit from seed treatment if the risk of disease is high. Where there was little to no disease pressure, however, seed treatment had no significant effect. Historically, metalaxyl and mefenoxam have been used as the primary seed treatments to protect soybean against watermolds, including both Phytophthora sojae and Pythium spp. There are now two additional fungicide seed treatments available — ethaboxam and oxathiapiprolin — that have efficacy towards P. sojae. Farmers who produce soybeans in high disease-risk environments should ensure that at least one of these products is in their seed treatment mix. Phytophthora sojae and other watermolds require free water and saturated soil conditions for zoospore development and movement towards the host. Avoid planting prior to predicted heavy storms where flooding or saturated soils will occur. Improving soil compaction and drainage is recommended and has been shown to improve the yield of moderately susceptible cultivars. Tiling and tillage can shorten the time that the soil is saturated. Interestingly, crop rotation has never been recommended as a management strategy for Phytophthora because oospores, the thick-walled survival structures of the pathogen, survive for long periods of time. Phytophthora root and stem rot of soybean. American Phytopathological Society/Plant Health Instructor, 2012. Oomycete Diseases of Soybean and Current Management. Webinar, University of Minnesota and Plant Management Network, 2013. Population Structure Among and Within Iowa, Missouri, Ohio, and South Dakota Populations of Phytophthora sojae. Phytopathology, 2016. Integrated Management Strategies for Phytophthora sojae Combining Host Resistance and Seed Treatments. Plant Disease, 2009.